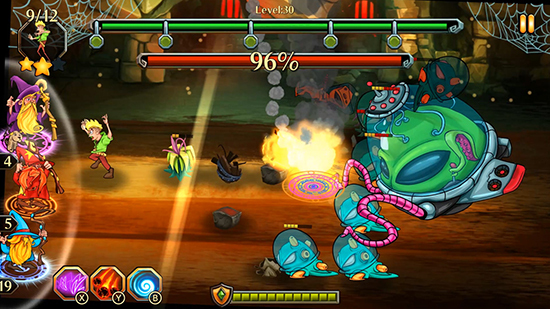 Dungeons & Aliens is a tower defense title where the player defends the left side of the screen from incoming aliens from the right side. Instead of deploying towers, the player controls the range attacks of dwarfs in real time. Each battlefield randomly features some barriers, like rocks or explosive barrels, in which the player can freely move when not shooting at the enemy so there is a slight element of strategy although gameplay is mostly based around level grinding. For only $3.99, Dungeons & Aliens on the Switch eShop would be a sleeper hit of a game if it wasn’t for the unbalanced difficulty and unnecessarily need to grind for gold to level up. For example, I reached level 10 in maybe thirty minutes but had to grind for a couple hours to actually complete it thanks to a boss with a ton of energy. Depending on player performance, the game rewards gold which can be used to purchase not only upgrades but special attacks. In addition to the constant magic the dwarfs throw at each enemy, they can also summon a special attack such as a fireball strike or a chained lightning attack. The problem is, these special attacks have limited uses, do not refill, do not replenish after each stage, and must be purchased individually in-between battles. So then the question becomes, do I buy a few fireballs, or save my cash to eventually earn an upgrade? The issue is that it takes forever to unlock an upgrade so every earned piece of gold is precious. The unbalanced difficulty and hours worth of grinding is tedious busy work and stands as this downloadable title’s biggest flaw. It just isn’t fun to play the same few levels over and over for hours just to slightly upgrade the one dwarf’s attack. Furthering the unbalance, there are moments when the player has little to no time to react to the enemy as they spawn right on top of the escaping dwarfs you are tasked with saving. This unfair and annoying enemy AI causes the player to lose a rank which means even less gold. It really is an unending loop of pacing issues and unbalance. If you don’t mind the tedious grind then Dungeons & Aliens could be a solid option if looking to scratch that tower defense itch. For everyone else, go play something else instead.